China Glaze Nail Lacquer "Sun of a Peach"
Lately, I have been obsessed with bright neon colors as I love the way they make my tan pop. I went to Ulta last week because I wanted a couple of nail polishes from the new fall 2015 China Glaze collection but they didn't have them yet. I took a look at their selection of China Glaze nail polishes and "Sun of a Peach" stood out to me. It was the brightest nail polish and it was too pretty to pass up. "Sun of a Peach" is a gorgeous bright peach color with a creme finish. It takes 2 coats for full opacity and dries within a reasonable amount of time. This nail polish wears really well- after 4 days it started to chip slightly at the edges. I love this nail polish and I already went and picked up more shades to try! Dewy highlighted skin is trendy now and in the makeup world there has been a several new highlighters released with this illuminator being one of them. 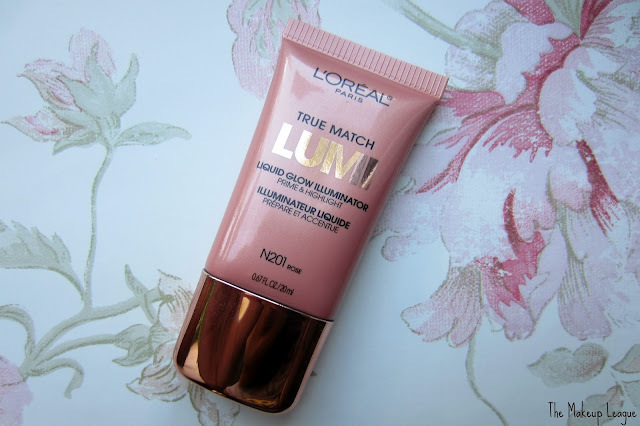 This is a liquid illuminator that can be used as a primer or highlighter. This comes in range of 3 shades: Ice, Rose and Golden. Ice works well for cool tones, Rose works for Neutral skin tones and Golden looks great on darker skin tones. I purchased this at Ulta and it retails for $12.99 and contains 0.67 fl oz of product. I got Rose as I am obsessed with rose gold although I think I would be better off with Golden. Rose is a shimmery peachy-rose shade. It looks very subtle on my skin but it looks gorgeous when I apply it on my body. I have used it under my foundation but I don't really notice a difference like when I use strobe cream under my foundation. It is very subtle under foundation. 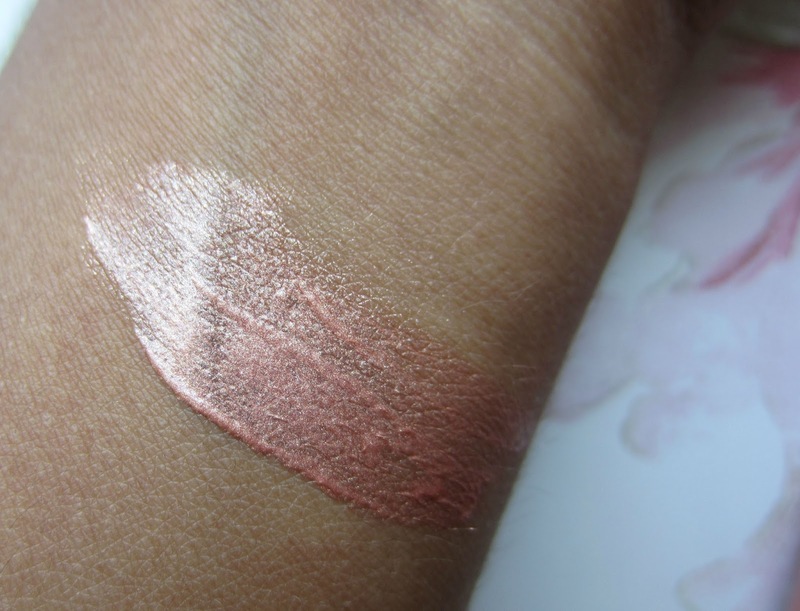 Overall, I like this illuminator- its subtle but I prefer using it on my body. This range of illuminators may be nice for those who want to experiment with liquid illuminators but make sure you get it on sale. End of the month = new monthly beauty review. I'm changing the style of my monthly beauty favorites as I'd like to not only talk about products that I have been using this month that I like but also briefly review some products that I may not like for whatever reason. I have been trying a lot of new products this month and there are a few products that I have been loving and some that I'm not too crazy about. NYX Eyebrow Gel: I don't have a real eyebrow routine because I do not have to fill in my brows too much- I just need to fill them in slightly. I have been using e.l.f eyebrow kit which I love but I'm running out of it and I heard that this gel is a dupe of the Anastasia eyebrow pomade. I LOVE this gel as you only need the tiniest bit to fill both brows in and its basically waterproof. This lasts all day on my brows. This is definitely going to last me a long time. Tarte Lights, Camera, Lashes Mascara: This is a deluxe sample that came in a Tarte box that I bought from Ulta. I heard great things about this mascara and it didn't disappoint me. It gives my lashes amazing length and volume and I only need one coat for each lash. The size of the brush is great for my lower lashes as well. 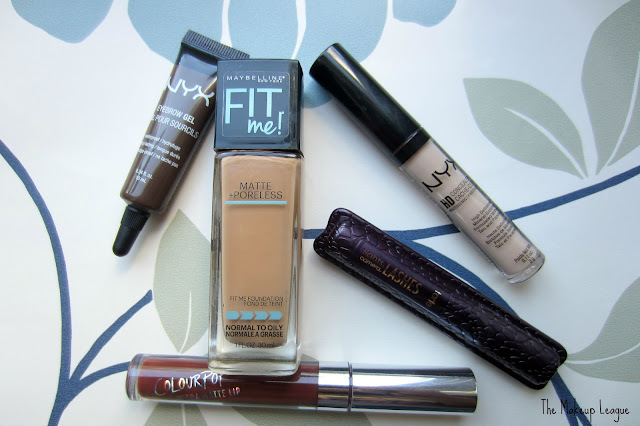 Maybelline Fit Me Matte + Poreless: When I tried this foundation during the winter I wasn't a huge fan of it because my skin was dry then and this foundation is ideal for normal to oily skin ladies. I have been loving this foundation as it doesn't make my face look like an oil slick, good coverage and its long wearing. This foundation is so much better than the original Fit Me foundation. NYX HD Concealer: This is my favorite drugstore concealer- I have about 3 shades of this concealer and I will always repurchase. It covers my dark undereye circles very well and it lasts throughout the day. It's also very affordable- retail approximately $5. However, I do need to set it with powder as it will crease if I don't. Colourpop Ultra Matte Lipsticks: I'm on of those people who spent a long time refreshing Colourpop's website so I could get my hands on a couple of these lipsticks. I basically fell into the hype on youtube and I regret buying them. This range has a large selection of colors which I like but the formula is very drying (You can check out my first impression here). I find that using Mac's Prep + Prime lip helps slightly. I love beauty and makeup. Since I was a teen I would spend my time watching makeup videos on youtube. At the time I had no idea about anything makeup and beauty related. I found the whole process confusing but fascinating at the same time. At the time I had absolutely no idea what foundation was! I learned a lot from Youtube and my favorite youtubers inspired me to start blogging. It was a very different time for youtubers and bloggers as they did it as a hobby and to meet other beauty obsessed people. Fast forward to now and many things have changed. Youtube and blogging for some has become an easy way for them to make money and reach internet fame. Sponsors sounds like fun and games until bloggers and youtubers "forget" the rules and don't disclose the fact that new makeup primer that they LOVE although they only have been using it for a day was not purchased by them and that coupon code that they're shoving in your face every 5 seconds will actually make them money. I get it, blogging and making videos takes a lot of work. I know. I understand that while the brand is making money from you bringing them customers you want to get paid as well. However, there's nothing wrong with being honest and letting your subscribers know that the product you're featuring is sponsored. Why? Well, your subscribers are hard working people who want an honest review about a product and unlike you who received the product for free (no problem with that) they want to buy a product that will perform. There are countless times where a blogger or youtuber (I notice this on problem more on youtube) RAVED about a product and then people who purchased the product didn't like it- myself included. I once bought some lippies based on a ton of youtubers recommendations and once I tried it-it was nothing like they claimed. Bottom line, disclosing is crucial because no one likes an dishonest blogger. I haven't experienced this personally but I have seen a lot of drama in the youtube and blogging worlds. Some bloggers have insinuated that other bloggers have purchased followers and some youtubers have drama with others for many different reasons. It seems like sometimes some bloggers and youtubers compete with each other for popularity, more views and subscribers etc. Like I said, I haven't experienced this and I have made friends with a few bloggers- One blogger was even nice and patient enough to help me with my blog design! Competition definitely exists among some bloggers and youtubers because they may feel like they have to compete with each other for subscribers and attention from PRs. PRs are people who work for a particular brand and they contact bloggers and youtubers and ultimately work together so that the person receives the product and may or may not feature it in their blog, youtube or social media sites. I haven't worked with many brands as I am a new blogger but I have heard of countless bloggers who complain that brands pressure them to only provide good reviews for their products and even not state that they received the products from them for free. A good example is when the owner of Limecrime got upset when a blogger gave an honest review of her products (which wasn't even negative) and Doe Deere bullied the blogger and threatened legal action if the blogger did not provide a glowing review about Limecrime (You can read more about this here). This pressure from brands creates an ethical dilemma for bloggers because they want to maintain a positive relationship with PRs so that they can continue working together in the future but they do not want to compromise their honesty and their morals. I have experienced this once when I saw that a brand was seeking bloggers to test their products and one of their requirements was that the blogger had to post a positive review. Needless to say, I steered clear from them. There are also other issues between brands and bloggers/youtubers. We all know that there are many makeup brands that neglect to create foundation/concealer shades that match women of color which is not cool at all. I will never understand why brands feel as though they can neglect certain people of their target demographic as this causes them to lose business. Fortunately, there are makeup brands like NARS who have a large range of shades to suit many different skintones. Another issue is that there are many PRs who choose to not work with bloggers and youtubers of color. When a new product is going to be released the brand's PR sends makeup to many bloggers and youtubers but to very few bloggers and youtubers of color. Earth to makeup brands- we need these women to get press samples as well because we need to see how your product looks like on women of color. I love blogging with all my heart but with all things in life there are good things and bad things and blogging is no exception. 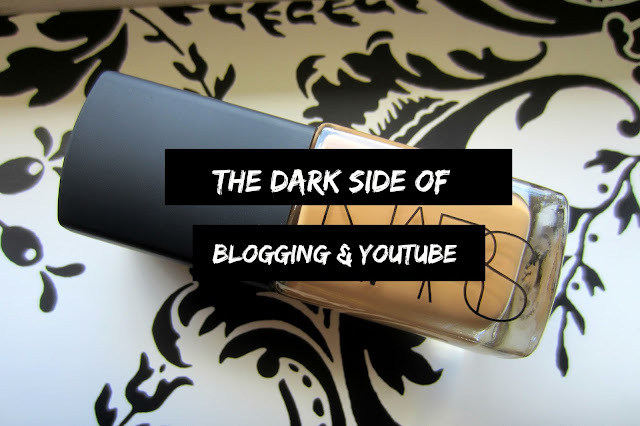 There is a small dark side of blogging and youtube and hopefully there will be a change and makeup brands, bloggers and youtubers will play by the rules.